What if matter is not solid, fixed and dead, but a living and creative Event? Could the concrete ‘stuff’ of our existence be in the process of development and becoming? Rudolf Steiner predicted that the new Christ Event would penetrate and transform all earthly and cosmic matter, life, consciousness and evolution. Through this Event, we have the opportunity to participate in the vortex of creative life. No longer detached, external spectators, we become co-creators in the drama of evolution and in the transformation of human consciousness. 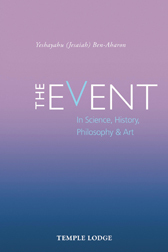 In this original and challenging work, Dr Ben-Aharon describes how this momentous Event is expressed in the fields of science, history, philosophy and art, and relates some of the fresh and creative concepts that have been discovered and applied in the disciplines of physics, biology, genetics and artificial intelligence. The Event, he concludes, leads us to face the central and world-historical question of our time: Are we as a human race going to use the new creative forces that are available to us positively, or will we allow this potential for good to change into its – destructive – opposite? The choice is ours. DR YESHAYAHU (JESAIAH) BEN-AHARON – spiritual scientist, philosopher and social activist – is founder of the anthroposophical community in Harduf, Israel, co-founder of the Global Network for Social Threefolding, director of Global Event College and contributor to the School of Spiritual Science. He is the author of Cognitive Yoga, Spiritual Science in the 21st Century, The Spiritual Event of the Twentieth Century, The New Experience of the Supersensible, America’s Global Responsibility and Cognitive Yoga: How a Book is Born.